Featuring a double layer construction, 1000 Mile Ultimate Tactel Multi-Sport Trainer Liners are designed to for maximum comfort, with a firm promise of no blisters, due to the reduction of friction between outer and inner, and the ability of the Tactel® inner layer to wick away moisture from the skin, keep feet dry (a side-effect of this layering is that wear on the liners is reduced also, for longer useful life). Venting in the top of the cotton rich outer layer allows moisture to escape swiftly and moves fresh air in, to help maintain a constant comfortable temperature. 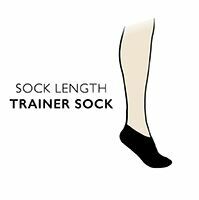 1000 Mile Ultimate Tactel Multi-Sport Trainer Liners have Heel Power technology, shaping the sock and along with built-in arch bracing creates a secure, supportive fit. A high backed cuff protects the vulnerable tendons from injury.